Just Flour is a milling company based in Phoenix Industrial Park, Kwazulu-Natal. They are producers of industrial bread, cake flours and digestive bran products, which they supply to bakeries, as well as ‘speciality’ flours which they produce in their traditional stone mill. They possess four storage silo’s, the two largest silo’s being 14.6m in diameter and 24m tall with a storage capacity of 3000 tons of grain. One of the larger silo’s, which was filled to capacity at the time, formed a buckle just below halfway up on the eastern side. LOVEMORE BROS we’re called onto site to assess the situation and propose a solution to contain and secure the silo so that the client could safely drain the product from within. A surveyor was brought onto site to monitor the silo on a daily basis while the LOVEMORE BROS mechanical projects team began to fabricate and install an exoskeleton around the silo. Within the space of a week columns were erected around the silo and the silo was temporarily contained. After week two the exoskeleton was completed and the silo was contained, ensuring that the silo could not collapse and thus the product within was no longer at risk. 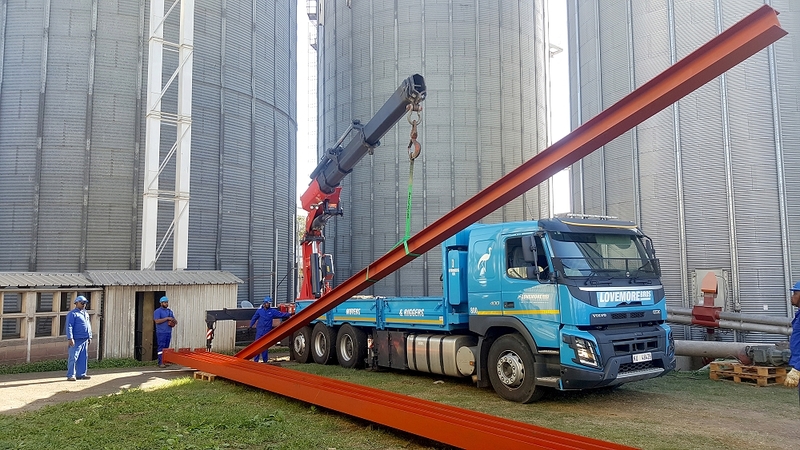 By the end of week three additional supports had been created for the conveyors above the silo and their original supports off the silo were cut free thus alleviating any additional stresses caused by the weight of the conveyors on the silo and visa-versa. By week four the client began draining product from the silo and final supports were being erected to support the silo in order to stop it from collapsing under its own weight once empty.